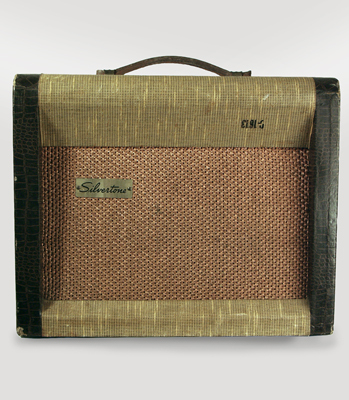 Danelectro Silvertone Model 1331 Model Tube Amplifier (1958), made in Neptune, NJ, two-tone fabric finish. Height is 14 in. (35.6 cm. ), 17 in. (43.2 cm.) wide, and 8 1/2 in. (21.6 cm.) deep. Just emerged from a service tweak, with some changed caps and a new 3-prong cord, but overall a nicely original amp. The back panel is a piece of uncovered Masonite, so we assume it's an old replacement, although the screws are still original. There are no other major alterations, just some wear to the covering and some old dust inside! A good-sounding Danelectro creation; really nails that period snarl when cranked. Excellent - Condition.